Thank goodness I am not a member of aristocracy because I have no prejudices against eating food with my hands. Sandwiches are not something I eat a lot of, perhaps because of the bad press they have gotten ie, Wheat Belly, Hi Carbs, Gluten. But there are times when nothing satisfies like a sandwich, especially when it is a Vietnamese sandwich called the Banh Mi. Colonialism gave birth to this beauty of a sandwich with the French contributing the baguette, pate, mayonnaise and the Vietnamese adding their cilantro, jalapeno, pickled carrot and daikon. 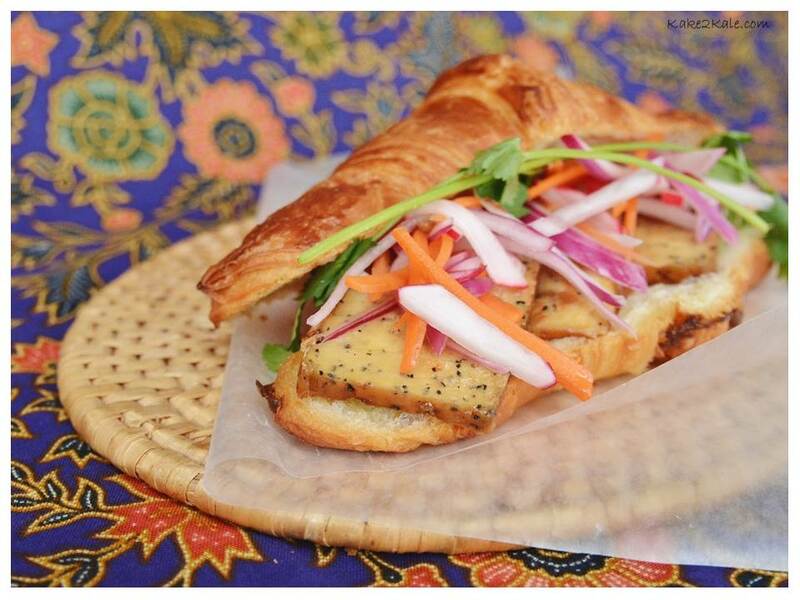 My recipe here is the vegetarian version which would be called a Banh Mi Chay. I substituted croissant for the baguette only because my local French bakery was sold out of the baguettes. Because the croissant is already so rich, I skipped the mayonnaise, but if your cholesterol levels are good, then add the mayonnaise. I wasn’t able to get to the Asian market and so I substituted daikon with radishes, which works just as well. Carrot: Fantastic source of Vitamin A and beta-carotene, both important for eye health, as well as trace minerals. 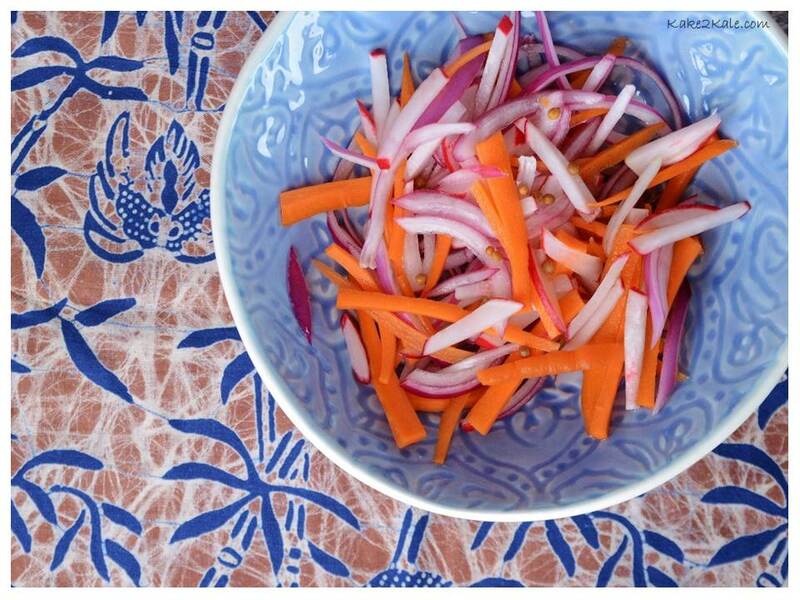 Radishes (and Daikon): They are a powerful detoxifier helping to support the liver. Contains Minerals, vitamins – particularly vitamin C and phytonutrients. It is a cruciferous vegetable (see Broccoli). 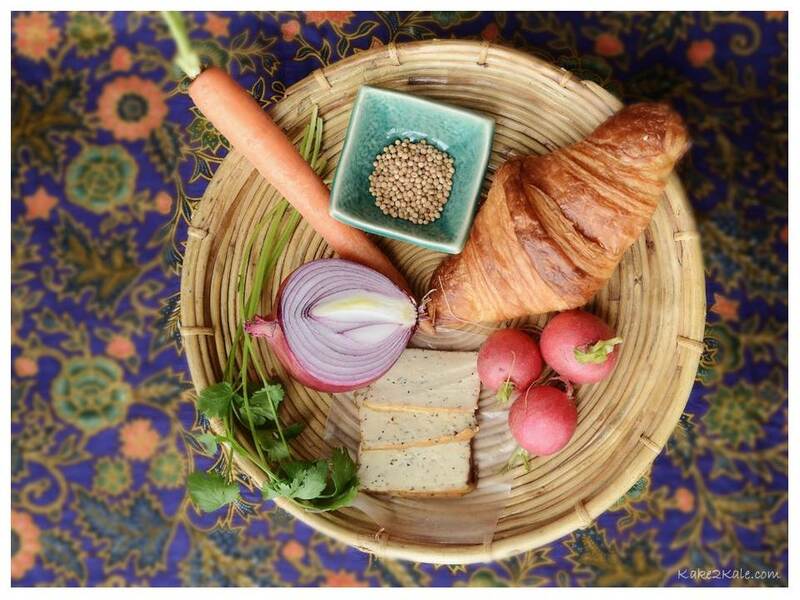 Red Onion: High amount of quercetin, an anti-histamine that helps your body combat allergies. Onions are also antibacterial, antiseptic, detox properties, lowers cholesterol, and protects the heart. Tofu: Rich in protein, iron, copper, selenium, and calcium. Tofu is also high in isoflavones that behaves like estrogen, which is very helpful for women who are in menopause. In menopause, estrogen levels are in decline and may, for example, cause night sweats and/or weight gain. Cilantro: It contains lots of vitamin B’s, A, and C, as well as minerals, like potassium, calcium, magnesium and iron. Also contains antioxidants like quercitin (which is a natural anti-histamine). Cilantro can also help detox heavy metals from the body. Heat sugar, rice vinegar and water into a small saucepan over medium heat and bring to a boil. Once boiled stir constantly for 1 minute, until sugar is dissolved. Then remove from heat. Once vinegar mixture is cooled add the carrots, daikon and red onion. Mix well. Set aside for minimum of 30 minutes. While vegetables are being pickled, slice the tofu into 12 slices and then sauté in a pan with a little olive oil until golden brown. 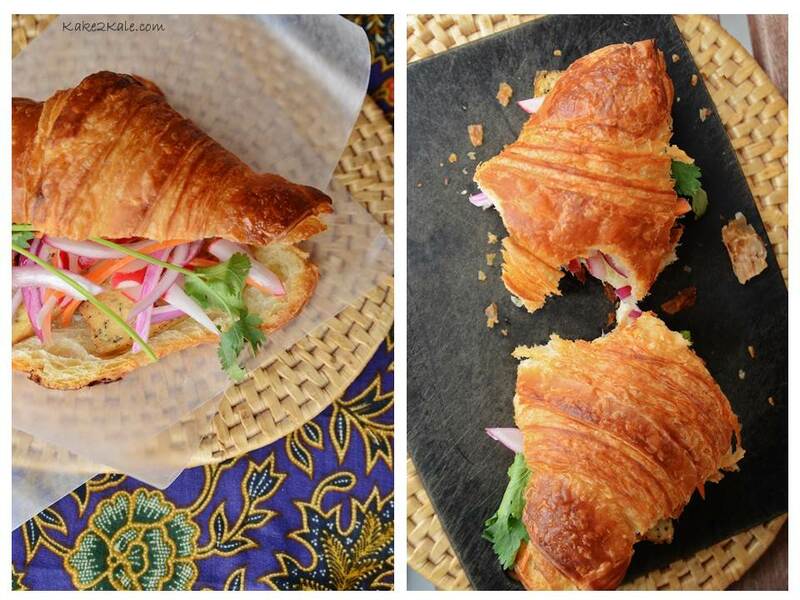 To assemble split the croissants in half, spread with place 3 slices of tofu on each croissant, top with pickled vegetables and a couple of sprigs of cilantro and jalapeno slices (optional). For your interest, there is also a dessert sold on the streets of Vietnam that is a baguette filled with scoops of ice cream and topped with crushed peanuts. Never having been to Vietnam, I have not had one of these, but there is a restaurant in town called the Soho Tea Room and they serve a Toast Box which is essentially an ice cream sundae served in a hollowed out loaf of bread, with cubes of toasted bread. The combination may sound odd, but it’s surprisingly tasty. The bread is like a thick chewy ice cone that gives the texture of the ice cream a grounding element as it melts in your mouth! Mmmmm, perhaps next food adventure will take me to the bakery and the ice cream section of my local market.